Last September space shuttle Atlantis carried Joe Tanner and five other astronauts to the International Space Station to install two 17-ton truss segments, the first large sections added to the orbiting facility in nearly four years (see "How Things Work" in the Feb/March 2007 issue of Air & Space). Tanner’s spacewalk was going smoothly when he discovered a potential showstopper: a worn bolt starting to become stripped of its threads. 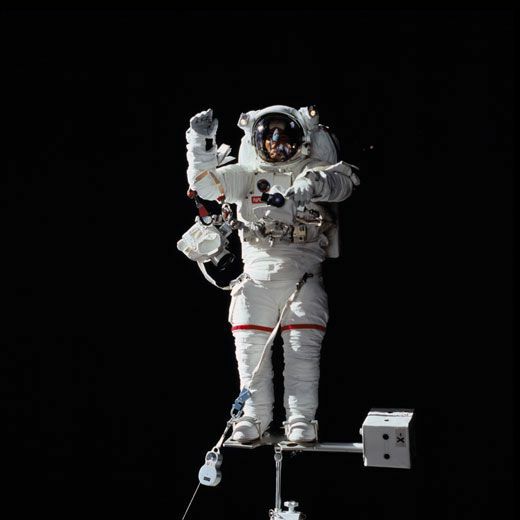 Tenaciously, the astronaut worked the bolt with his pistol-grip hand drill until it came free, enabling him to attach the new 45-foot section to the station’s truss. “It stressed me out,” Tanner says. “If anything would have gone wrong with that bolt, the mission would be over.” It just goes to show that a lot depends on the equipment astronauts carry with them on a spacewalk. The gadgets need to be specially designed for use in space—hardened against the vacuum, resistant to extreme temperatures, and easy to use while wearing gloves. Below are a few of the tools used to construct the International Space Station, one of the most challenging feats of engineering ever attempted. 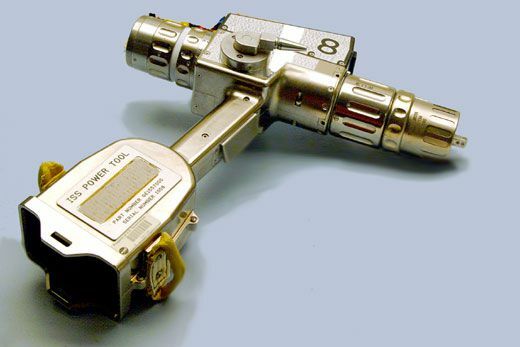 The main tool used by spacewalkers is this 21st century hand-drill, built by Swales Aerospace Inc. Designed for use in the thick-gloved hands of spacewalkers, it features a pistol-style handle and large information screen. Astronauts can program the speed and torque, and the settings show up on the screen. The torque can range from less than 1 to 38 foot-pounds of force, and the drill can run at anywhere between 5 and 60 rotations per minute. According to NASA, this is the first hand-held electronic power tool to include all the features of a cabinet-mounted tool, courtesy of the configurable design. A rechargeable battery slots into the handle like the clip of a handgun. Its metal hydride batteries can hold more charge at extreme temperatures—perfect for the cycles of shadow and sunlight the station experiences in orbit. The body is made of a durable, glass-infused plastic called Lexan. But you won’t see it; the whole thing is covered with aluminum tape for durability. NASA began developing the requirements for the three-pound tool in 1993 to make repairing the Hubble Space Telescope easier. It was first used in space in 1997. Engineers are not eager to design another one—the pistol-grip tool is modular so improvements can be added later. The Canadian government chipped in $1.1 billion to develop a jointed construction crane that astronauts use to position themselves and large pieces of equipment during ISS construction. The Mobile Servicing System, better known as Canadarm 2, is a larger version of the space shuttle’s long robot arm, and its reach is eight feet longer. 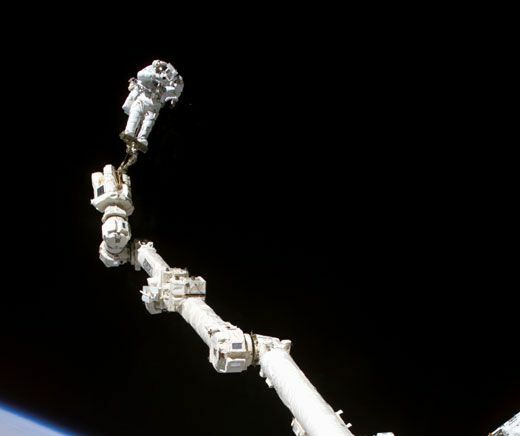 The space station arm was developed to move objects of more than 200,000 pounds. Or it can delicately move suited astronauts, plucking them up from the airlock and transferring them to designated work areas and back again, like a mother cat relocating kittens. The arm moves along a track built into the truss. Inside the station, astronauts use closed-circuit TV to guide the crane. Unlike the shuttle arm, Canadarm 2 has force sensors to provide an artificial sense of “touch” and an automatic collision avoidance system. Leaks of fluid or gas from the space station during construction can be a big deal. For example, when spacewalking astronauts connected the Destiny laboratory module to the ISS in 2001, a plume of ammonia was spotted jetting from the hose lines they had just installed. The hazardous coolant was seeping from the fittings that connected the lines. What if the leak had been too small to spot? Oceaneering Space Systems of Houston and NASA’s Jet Propulsion Laboratory developed an answer—the world’s smallest high-performance mass spectrometer. The analyzer is about two inches long, part of a larger unit that weighs about five pounds. The shoebox-sized system is placed on an astronaut’s chest so it can easily be pointed at areas of interest. It can also detect leaking water, seeping rocket fuel, or escaping oxygen. Other tethers serve as toolbelts. Without these short tethers, equipment would zip away into space, where they would risk collision with the station or shuttle. Self-closing trash bags are also available for stowing extra bolts.